Pustular (pus) Psoriasis are small yellow pustules within a red rash area such as the foot picture above. The pustules are normally about 1/20 or an inch or one millimeter to a larger size of 1/10 of an inch or two millimeters in size. The underlying skin area beneath the yellow pustules is always a red patch of psoriasis. The pustular area is very sensitive and painful even when not walked upon so you can imagine the pain when one has to be mobile. To fight the infection, a large group of T-cells which belong to the white blood cell group or lymphocyte invade the area to improve the immunity which allows for new cell regeneration and healing. In several days, a change can be seen as the yellow pustules began to disappear. Then scaling will be the next phase which will then began to breakdown and for the skin to began to heal. Or, if the immune system is not strong enough, another cycle of yellow pustules will start over again. Pustular (pus) Psoriasis most often affects the hand palms and soles of the hands and feet. Yes, a most unfortunate skin condition as we all have to walk on our feet soles and use the palms of our hands to do most common functions. 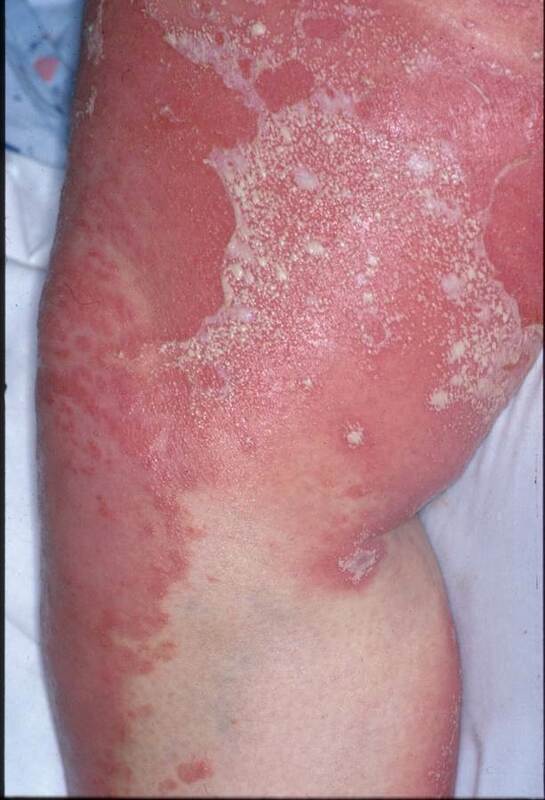 Generalized pustular psoriasis (in the above picture) is marked by a general reddening and inflammation of the skin with sheets of small pustules merging into larger sheets. This is a serious and potentially life-threatening illness that can severely disrupt the skin’s function. Pustular (pus) Psoriasis is also known as 'von Zumbusch pustular psoriasis' who was the physician that found the first case of pustular (pus) psoriasis in the early part of 1900. Sadly, the reason that German dermatologist Leo Ritter von Zumbusch was able to find the first case could be that he possibly could have administered steroids. Pustular psoriasis most often has a cause resulting from stopping the overuse of steroids. Either oral or topical steroids could have been used. Oral steroids are not good for the patients as the immune system own defense is replaced by the steroids and our natural glands wither, shrink or atrophy. The skin become very fragile, weak or very sensitive and painful with the use of steroids. The patients should began to taper off or reduce the use of steroids within 2 weeks or 30 days. The patient can taper off by a combination of two methods: 1) reduce the amount used daily and 2) stop daily use of steroids by alternating every two days, then go to every three days, and then every four days. And of course use less during each application.